and eventual cessation of the printing press at the Fed. There actually is a mathematical formula used by the Federal Reserve to determine when to stop the presses. POP2 = [1-(%∆POP) m*m] *POP1. Or, I could share the link to the Federal Reserve's Jobs Calculator in Atlanta. This is the same calculator used by the Fed to determine when the jobs market and the unemployment rate will align properly. And when they do, it will signal to the Federal Reserve that it might be a good time to start tapering its $85 billion a month bond buying program. This is what needs to happen: The economy will have to show new job growth. 2. We must add 150,000 to 200,000 or more jobs every month for six consecutive months. When these goals are reached the Federal Reserve will likely consider slowing the printing press. When this will happen can be determined by reading the Federal Reserve's Jobs Calculator in Atlanta. When you enter a target unemployment rate of 7.0 and wegive ourselves 12 months to achieve our 7.0 unemployment rate we would need to average 166,796 new jobs monthly to hit our target. added each month, we can figure out when the Fed has a green light for the Fed to stop printing. Q: Why does the Federal Reserve care about the unemployment rate? A: Section 2A of the Federal Reserve Act states, "The Board of Governors of the Federal Reserve System and the Federal Open Market Committee shall maintain long-run growth of the monetary and credit aggregates commensurate with the economy's long run potential to increase production, so as to promote effectively the goals of maximum employment, stable prices, and moderate long-term interest rates." This part of the Federal Reserve Act is often referred to as the Fed's "dual mandate." Basically, it states that the Federal Reserve's monetary policy has the goals of stable prices and maximum employment. The unemployment rate is the most popular statistic that measures the degree to which the Federal Reserve has achieved the goal of maximum employment. Q: What are the sources of the numbers behind the Jobs Calculator? A: The current labor market statistics reported each month by the U.S. Bureau of Labor Statistics (BLS) are used to support the Jobs Calculator. These statistics are derived from two surveys, the Household, or Current Population, Survey and theEstablishment, or Payroll, Survey. (For definitions of terms and concepts, consult the official BLS Handbook of Methods.) Of course, these sources supply the underlying statistics; the user supplies the desired unemployment rate and time frame. Q: Does a decline in the labor force participation rate mean people are leaving the labor force because they are discouraged about finding a job? A: According to the BLS definition, a discouraged worker is someone who wants a job, is available to work, has sought work sometime in the previous 12 months, but has not looked for work in the previous four weeks because of a belief that no jobs for which they would qualify are available. On average, 93 percent of those not in the labor force in 2011 said that they did not want a job so they would not have been eligible to be classified as discouraged. Among those who were not currently in the labor force, but who wanted a job and had looked for work in the previous 12 months, 38 percent were classified as "discouraged," 8 percent were not in the labor force because of family responsibilities, 13 percent were in school or undergoing training, 6 percent indicated health or disability for their reason to not be in the labor force, and 34 percent were out of the labor force for some other unspecified reason. Q: How important is labor force growth in hitting the target unemployment rate anyway? 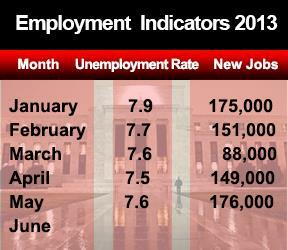 The number of months necessary to achieve a given unemployment rate is also important. For example, try using the Jobs Calculator to change only the number of months. Leave everything else the same and notice what happens to the implied monthly growth in the labor force. Keeping the labor force participation rate and population growth constant, the longer the time period you allow, the smaller the implied growth in the labor force-and, consequently, the fewer number of net jobs need to be created each month to absorb the implied change in the labor force. Q: What about other measures of unemployment? A: The Jobs Calculator uses the definition of unemployment and labor force most commonly highlighted in the media and economic research (see the BLS's explanation). The BLS also computes five other unemployment rate measures using different definitions of the labor force-for example, including discouraged job seekers. In general, these various unemployment rate measures tend to move together over time. Q: Where can I find more information on the unemployment rate? A: The BLS website is a great resource. See, for example, "How the Government Measures Unemployment" or the FAQsabout labor force statistics. Q: Why are labor force and population growth not equal in the Jobs Calculator when the labor force participation rate does not change? A: Technically, it is true that since the labor force participation rate (LFPR) is the ratio of the labor force (LF) and population (POP), it must be the case that if the LFPR is not changing, the growth in LF and POP must be the same. Of course, Bernanke's's recent comments sound like a calculator is the furthest thing from his mind. They've been confusing at best, causing market volatility. I hardly leave remarks, but i did some searching and wound up here You can Figure out When the Fed Might Start Tapering – Money Morning. And I actually do have a couple of questions for you if it's allright. Could it be only me or does it appear like a few of these comments come across like they are left by brain dead individuals? :-P And, if you are writing on other online sites, I would like to keep up with anything fresh you have to post. Could you list of all of your community pages like your twitter feed, Facebook page or linkedin profile?